Living large on a smaller footprint is a way of life to which many socially and environmentally conscious people aspire, but Aurora student Laura Ing wants to make these aspirations more attainable than ever before. Laura, a Grade 12 student, was part of a team which put their heads together over the summer in Halifax to figure out how people can do just that – live large on a small footprint. Their combined efforts won them Best Overall, tying to win the SHAD Entrepreneurship Cup last month at the University of Waterloo. “Our brainstorming process was really long and it took about two weeks to come up with our final idea for the product, but it was actually an idea we had on our first day of brainstorming,” says Laura. “We were just throwing ideas out there asking what was wasteful in our society. Team Evita’s solution focuses on reducing the amount of “phantom power” used in the home by seemingly idle appliances such as computers and TVs. Using radio frequency identification (RFID) technology, small transmitters connected to appliance power bars can communicate with chips you can carry with you, such as on a keychain, that can turn on or turn off your TV or computer depending on whether or not you are in the room. 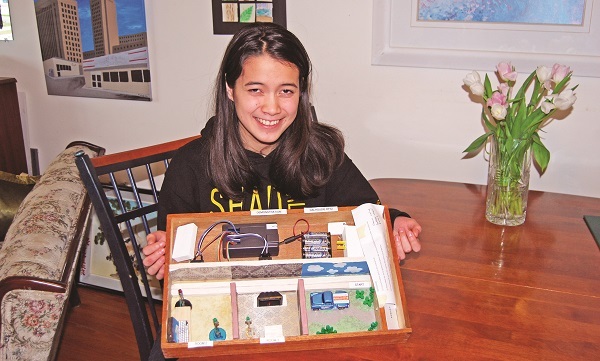 At her Aurora home, Laura proudly displays a working model of the device and how it can be applied to a variety of uses. Their concept, however, was not entirely unique. Judges in the SHAD program instilled in them the philosophy to keep whatever they came up with to work on their “Living Large on a Smaller Footprint” theme simple and elegant, but while the team’s final project was more complicated they – and judges – anticipated, they decided to go for function over form. “Our next steps would be to make it more applicable to everyday usage because right now it is more for businesses with large amount of computers, or schools where you always have those desktop computers sitting on and are never turned off,” says Laura. “We need to make it more applicable to everyday life, such as a household here where you would have your own kids with their own separate individual tags to make it less expensive for the consumer market. Laura and some of her teammates will be back at Waterloo this January to brainstorm ways to continue developing their product, to enhance the concept, and work towards making it a viable idea that can hit the consumer market. She says she is eager to get the mentorship to take the concept to the next level. Laura came into the SHAD program following her brother’s footsteps. Although she describes herself as a bit of an introvert, she says she not only found it easier to socialise through this collaborative effort but in learning aspects of business and technology she wouldn’t otherwise have in school. After dissecting a crayfish in a Grade 5 science lesson, she became fascinated with animals and plants and although she initially wanted to pursue a career as a botanist, her goal is to now study biomedical engineering at Waterloo next fall.